YOU NEVER KNOW HOW EVIL YOU TRULY ARE UNTIL SOMEONE UPSETS O - ProudMummy.com the Web's Community for Mums. 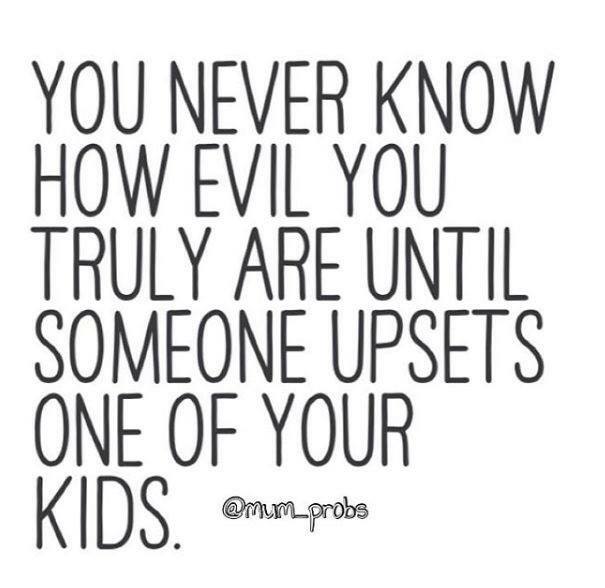 YOU NEVER KNOW HOW EVIL YOU TRULY ARE UNTIL SOMEONE UPSETS ONE OF YOUR KIDS. So true, especially when their little 'angel' then encourage their little acolytes to copy them!!! Too right. My kids my world. Too tight! I’d kill! Jenn Dodd, Eleanor Taylor, Luke James Taylor! I have 3 now!! Haha Kim Leeson so you!